Freedom and Liberty. Tens of thousands of votes cast determined the names of the two eaglets born in the National Arboretum in Washington, D.C., last month. The Friends of the National Arboretum announced the winners on its Facebook page on Wednesday. In its announcement, the group included the hashtag #nolongerDC2andDC3, the previous monikers of the eaglets. “I’ve watched them since they hatched. Feel like they are my little babies!” said one Facebook user. 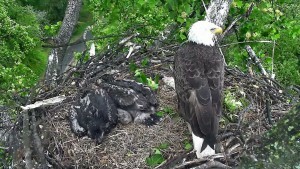 The hatchlings did garner quite a bit of attention when they were born on the eagle webcam. Their parents, known as Mr. President and The First Lady, built the nest in the arboretum in 2014. These babies are their second and third. Left: Screen image from the live eagle webcam at the National Arboretum in Washington, D.C.